"Haneda" redirects here. For the neighborhood of Ōta, Tokyo, see Haneda, Ōta, Tokyo. "Tokyo International Airport" redirects here. For Tokyo's other international airport, see Narita International Airport. Tokyo International Airport (東京国際空港, Tōkyō Kokusai Kūkō), commonly known as Haneda Airport (羽田空港, Haneda Kūkō), Tokyo Haneda Airport, and Haneda International Airport (IATA: HND, ICAO: RJTT), is one of the two primary airports that serve the Greater Tokyo Area, and is the primary base of Japan's two major domestic airlines, Japan Airlines (Terminal 1) and All Nippon Airways (Terminal 2), as well as Air Do, Skymark Airlines, Solaseed Air, and StarFlyer. It is located in Ōta, Tokyo, 14 kilometres (8.7 mi) south of Tokyo Station. Haneda was the primary international airport serving Tokyo until 1978; from 1978 to 2010, Haneda handled almost all domestic flights to and from Tokyo as well as "scheduled charter" flights to a small number of major cities in East Asia, while Narita International Airport handled the vast majority of international flights. In 2010, a dedicated international terminal was opened at Haneda in conjunction with the completion of a fourth runway, allowing long-haul flights during night-time hours. Haneda opened up to long-haul service during the daytime in March 2014, with carriers offering nonstop service to 25 cities in 17 countries. The Japanese government is currently encouraging the use of Haneda for premium business routes and the use of Narita for leisure routes and by low-cost carriers. Haneda handled 85,408,975 passengers in 2017; by passenger throughput, it was the third-busiest airport in Asia and the fourth-busiest in the world, after Hartsfield–Jackson Atlanta International Airport, Beijing Capital International Airport (Asia's busiest), and Dubai International Airport. It is able to handle 90 million passengers per year following its expansion in 2010. With Haneda and Narita combined Tokyo has the third-busiest city airport system in the world, after London and New York City. Before the construction of Haneda Airport, aviators in Tokyo used various beaches of Tokyo Bay as airstrips, including beaches near the current site of Haneda. (Haneda was a town located on Tokyo Bay, which merged into the Tokyo ward of Kamata in 1932.) In 1930, the Japanese postal ministry purchased a 48-hectare (120-acre) portion of waterfront land from a private individual in order to construct an airport. Haneda Airfield (羽田飛行場, Haneda Hikōjō) first opened in 1931 on a small piece of bayfront land at the south end of today's airport complex. It was Japan's largest civil airport at the time it was constructed, and took over from the army air base at Tachikawa as the main operating base of Japan Air Transport, then the country's flag carrier. The first flight from the airport on August 25, 1931 carried a load of insects to Dalian. During the 1930s, Haneda handled flights to destinations in Japan mainland, Taiwan, Korea (both under Japanese rule) and Manchuria (ruled by Manchukuo). The major Japanese newspapers also built their first flight departments at Haneda during this time, and Manchukuo National Airways began service between Haneda and Hsinking. JAT was renamed Imperial Japanese Airways following its nationalization in 1938. Passenger and freight traffic grew dramatically in these early years. In 1939, Haneda's first runway was extended to 800 metres (2,600 ft) in length and a second 800-metre (2,600 ft) runway was completed. The airport's size grew to 72.8 hectares (180 acres) using land purchased by the postal ministry from a nearby exercise ground. During World War II, both IJA and Haneda Airport shifted to almost exclusively military transport services. Haneda Airport was also used by the Imperial Japanese Navy Air Service for flight training during the war. In the late 1930s, the Tokyo government planned a new Tokyo Municipal Airport on an artificial island in Koto Ward. At 251 hectares (620 acres), the airport would have been five times the size of Haneda at the time, and significantly larger than Tempelhof Airport in Berlin, which was said to be the largest airport in the world at the time. The airport plan was finalized in 1938 and work on the island began in 1939 for completion in 1941, but the project fell behind schedule due to resource constraints during World War II. This plan was officially abandoned following the war, as the Allied occupation authorities favored expanding Haneda rather than building a new airport; the island was later expanded by dumping garbage into the bay, and is now known as Yumenoshima. On September 12, 1945, General Douglas MacArthur, Supreme Commander for the Allied Powers and head of the occupation of Japan following World War II, ordered that Haneda be handed over to the occupation forces. On the following day, he took delivery of the airport, which was renamed Haneda Army Air Base, and ordered the eviction of many nearby residents in order to make room for various construction projects, including extending one runway to 1,650 metres (5,410 ft) and the other to 2,100 metres (6,900 ft). On the 21st, over 3,000 residents received orders to leave their homes within 48 hours. Many resettled on the other side of a river in the Haneda district of Ota, surrounding Anamoriinari Station, and some still live in the area today. The expansion work commenced in October 1945 and was completed in June 1946, at which point the airport covered 257.4 hectares (636 acres). Haneda AAF was designated as a port of entry to Japan. Haneda was mainly a military and civilian transportation base used by the U.S. Army and Air Force as a stop-over for C-54 transport planes departing San Francisco, en route to the Far East and returning flights. A number of C-54s, based at Haneda AFB, participated in the Berlin Blockade airlift. These planes were specially outfitted for hauling coal to German civilians. Many of these planes were decommissioned after their participation due to coal dust contamination. Several US Army or Air Force generals regularly parked their personal planes at Haneda while visiting Tokyo, including General Ennis Whitehead. During the Korean War, Haneda was the main regional base for United States Navy flight nurses, who evacuated patients from Korea to Haneda for treatment at military hospitals in Tokyo and Yokosuka. US military personnel based at Haneda were generally housed at the Washington Heights residential complex in central Tokyo (now Yoyogi Park). Haneda Air Force Base received its first international passenger flights in 1947 when Northwest Orient Airlines began DC-4 flights across the North Atlantic to the United States, and within Asia to China, South Korea, and the Philippines. Pan American World Airways made Haneda a stop on its "round the world" route later in 1947, with westbound DC-4 service to Shanghai, Hong Kong, Calcutta, Karachi, Damascus, Istanbul, London and New York, and eastbound Constellation service to Wake Island, Honolulu and San Francisco. 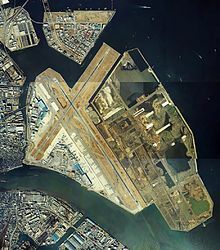 The U.S. military gave part of the base back to Japan in 1952; this portion became known as Tokyo International Airport. The US military maintained a base at Haneda until 1958 when the remainder of the property was returned to the Japanese government. Japan's flag carrier Japan Airlines began its first domestic operations from Haneda in 1951. For a few postwar years Tokyo International Airport did not have a passenger terminal building. The Japan Airport Terminal Co., Ltd. TYO: 9706 was founded in 1953 to develop the first passenger terminal, which opened in 1955. An extension for international flights opened in 1963. European carriers began service to Haneda in the 1950s. Air France arrived at Haneda for the first time in November 1952. BOAC de Havilland Comet flights to London via the southern route began in 1953, and SAS DC-7 flights to Copenhagen via Anchorage began in 1957. JAL and Aeroflot began cooperative service from Haneda to Moscow in 1967. Pan Am and Northwest Orient used Haneda as a hub. 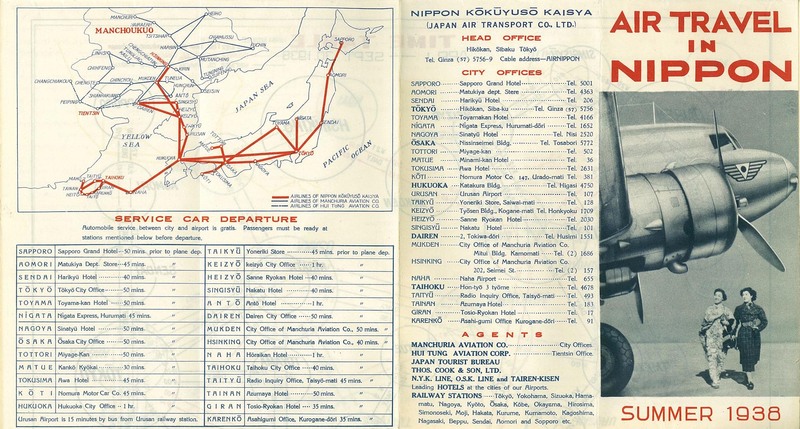 The August 1957 Official Airline Guide shows 86 domestic and 8 international departures each week on Japan Air Lines. Other international departures per week: seven Civil Air Transport, three Thai DC4s, 2 Hong Kong Airways Viscounts (and maybe three DC-6Bs), two Air India and one QANTAS. Northwest had 16 departures a week, Pan Am had 12 and Canadian Pacific had four; Air France three, KLM three, SAS five, Swissair two and BOAC three. As of 1966, the airport had three runways: 15L/33R (10,335 by 200 feet (3,150 m × 61 m)), 15R/33L (9,850 by 180 feet (3,002 m × 55 m)) and 4/22 (5,150 by 150 feet (1,570 m × 46 m)). The Tokyo Monorail opened between Haneda and central Tokyo in 1964, in time for the Tokyo Olympics. During 1964 Japan lifted travel restrictions on its citizens, causing passenger traffic at the airport to swell. The introduction of jet aircraft in the 1960s followed by the Boeing 747 in 1970 also required various facility improvements at Haneda. Around 1961, the government began considering further expansion of Haneda with a third runway and additional apron space, but forecast that the expansion would only meet capacity requirements for about ten years following completion. In 1966, the government decided to build a new airport for international flights. In 1978, Narita Airport opened, taking over almost all international service in the Greater Tokyo Area, and Haneda became a domestic airport. An aerial view of Haneda in 1984 showing the 1970 terminal on the west side of the field, the site of which is now occupied by the International Terminal. 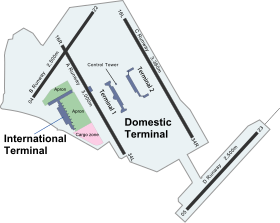 The large area under reclamation to the east would become the site of today's Terminal 1 and Terminal 2. 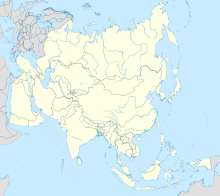 While most international flights moved from Haneda to Narita in 1978, airlines based in the Republic of China on Taiwan continued to use Haneda Airport for many years due to the ongoing political conflict between the Republic of China (Taiwan) and the People's Republic of China (China). China Airlines served Taipei and Honolulu from Haneda; Taiwan's second major airline, EVA Air, joined CAL at Haneda in 1999. All Taiwan flights were moved to Narita in 2002, and Haneda-Honolulu services ceased. In 2003, JAL, ANA, Korean Air and Asiana began service to Gimpo Airport near Seoul, providing a "scheduled charter" city-to-city service. Terminal 2, completed in 2004, now houses All Nippon Airways, StarFlyer, Skynet Asia and Air Do. The Transport Ministry released an expansion plan for Haneda in 1983 under which it would be expanded onto new landfill in Tokyo Bay with the aim of increasing capacity, reducing noise and making use of the large amount of garbage generated by Tokyo. In July 1988, a new 3,000-metre (9,800 ft) A runway opened on the landfill. In September 1993, the old airport terminal was replaced by a new West Passenger Terminal, nicknamed "Big Bird", which was built farther out on the landfill. New C (parallel) and B (cross) runways were completed in March 1997 and March 2000 respectively. In 2004, Terminal 2 opened at Haneda for ANA and Air Do; the 1993 terminal, now known as Terminal 1, became the base for JAL, Skymark and Skynet Asia Airways. In October 2006, Japanese Prime Minister Shinzo Abe and Chinese Premier Wen Jiabao reached an informal agreement to launch bilateral talks regarding an additional city-to-city service between Haneda and Shanghai Hongqiao International Airport. On 25 June 2007, the two governments concluded an agreement allowing for the Haneda-Hongqiao service to commence from October 2007. In December 2007, Japan and the People's Republic of China reached a basic agreement on opening charter services between Haneda and Beijing Nanyuan Airport. However, because of difficulties in negotiating with the Chinese military operators of Nanyuan, the first charter flights in August 2008 (coinciding with the 2008 Summer Olympics) used Beijing Capital International Airport instead, as did subsequent scheduled charters to Beijing. In June 2007, Haneda gained the right to host international flights that depart between 8:30 pm and 11:00 pm and arrive between 6 am and 8:30 am. The airport allows departures and arrivals between 11 pm and 6 am, as Narita Airport is closed during these hours. Macquarie Bank and Macquarie Airports owned a 19.9% stake in Japan Airport Terminal until 2009, when they sold their stake back to the company. A third terminal for international flights was completed in October 2010. The cost to construct the five-story terminal building and attached 2,300-car parking deck was covered by a private finance initiative process, revenues from duty-free concessions and a facility use charge of ¥2,000 per passenger. Both the Tokyo Monorail and the Keikyū Airport Line added stops at the new terminal, and an international air cargo facility was constructed nearby. The fourth runway (05/23), which is called D Runway, was also completed in 2010, having been constructed via land reclamation to the south of the existing airfield. This runway was designed to increase Haneda's operational capacity from 285,000 movements to 407,000 movements per year, permitting increased frequencies on existing routes, as well as routes to new destinations. In particular, Haneda would offer additional slots to handle 60,000 overseas flights a year (30,000 during the day and 30,000 during late night and early morning hours). In May 2008, the Japanese Ministry of Transport announced that international flights would be allowed between Haneda and any overseas destination, provided that such flights must operate between 11 pm and 7 am. The Ministry of Transport originally planned to allocate a number of the newly available landing slots to international flights of 1,947 kilometres (1,210 mi) or less (the distance to Ishigaki, the longest domestic flight operating from Haneda). 30,000 annual international slots became available upon the opening of the international terminal in October 2010, and were allocated to government authorities in several countries for further allocation to airlines. While service to Seoul, Taipei, Shanghai and other regional destinations continued to be allowed during the day, long-haul services were initially limited to overnight hours. Many long-haul services from Haneda struggled, such as British Airways service to London (temporarily suspended and then restored on a less than daily basis before returning to a daily service after receiving a daytime slot pair) and Air Canada service to Vancouver (announced but never commenced until Air Canada began a code share on ANA's Haneda-Vancouver flight). Delta Air Lines replaced its initial service to Detroit with service to Seattle before cancelling the service entirely in favor for the daytime services to Los Angeles and Minneapolis. In October 2013, American Airlines announced the cancellation of its service between Haneda and New York JFK stating that it was "quite unprofitable" owing to the schedule constraints at Haneda. Haneda Airport's new international terminal has received numerous complaints from passengers using it during night hours. One of the complaints is the lack of amenities available in the building as most restaurants and shops are closed at night. Another complaint is that there is no affordable public transportation at night operating out of the terminals. The Keikyu Airport Line, Tokyo Monorail and most bus operators stop running services out of Haneda by midnight, and so passengers landing at night are forced to go by car or taxi to their destination. A Haneda spokesperson said that they would work with transportation operators and the government to improve the situation. Daytime international slots were allocated in October 2013. In the allocation among Japanese carriers, All Nippon Airways argued that it should receive more international slots than Japan Airlines due to JAL's recent government-supported bankruptcy restructuring, and ultimately won 11 daily slots to JAL's five. Nine more daytime slot pairs were allocated for service to the United States in February 2016. They were intended to be allocated along with the other daytime slots, but allocation talks were stalled in 2014, leading the Japanese government to release these slots for charter services to other countries meanwhile. The new daytime slots led to increased flight capacity between Tokyo and many Asian markets, but did not have a major effect on capacity between Japan and Europe, as several carriers simply transferred flights from Narita to Haneda (most notably ANA and Lufthansa services to Germany, which almost entirely shifted to Haneda). In an effort to combat this effect, the Ministry of Land, Infrastructure and Transport gave non-binding guidance to airlines that any new route at Haneda should not lead to the discontinuation of a route at Narita, although it was possible for airlines to meet this requirement through cooperation with a code sharing partner (for instance, ANA moved its London flight to Haneda while maintaining a code share on Virgin Atlantic's Narita-London flight). An expansion of the new international terminal was completed at the end of March 2014. The expansion includes a new 8-gate pier to the northwest of the existing terminal, an expansion of the adjacent apron with four new aircraft parking spots, a hotel inside the international terminal, and expanded check-in, customs/immigration/quarantine and baggage claim areas. In addition to its international slot restrictions, Haneda remains subject to domestic slot restrictions; domestic slots are reallocated by MLIT every five years, and each slot is valued at 2–3 billion yen in annual income. Following Tokyo's winning bid for the 2020 Summer Olympics, the Japanese government plans to increase the combined slot capacity of Haneda and Narita, and to construct a new railway line linking Haneda Airport to Tokyo Station in approximately 18 minutes. JR East has considered extending an existing freight line from Tamachi Station on the Yamanote Line to create a third rail link to the airport, which may potentially be connected to the Ueno-Tokyo Line to offer a through connection to Ueno and points on the Utsunomiya Line and Takasaki Line. Although there had been discussion of completing this extension prior to the 2020 Olympics, the plan was indefinitely shelved in 2015. The Ministry of Land, Infrastructure and Transport is planning a new road tunnel between the domestic and international terminals in order to shorten minimum connecting times between the terminals from the current 60–80 minutes. Haneda suffers from airspace restrictions due to its position between Yokota Air Base to the west and Narita International Airport to the east. Due to these airfields' requirements and noise concerns, Haneda flights generally arrive and depart using circular routes over Tokyo Bay. As of 2015[update], there are plans to add a new arrival corridor over western Tokyo and a new departure corridor over Yokohama, Kawasaki and central Tokyo, which would be limited to afternoon hours. Additional taxiways must be constructed in order for Haneda to handle more flights, and construction is expected to take around three years. In the span of a month in 1966, three accidents occurred at, or on flights inbound to or outbound from, Haneda. February 4, 1966: All Nippon Airways Flight 60, a Boeing 727-81, crashed into Tokyo Bay about 10.4 kilometres (6.5 mi) from Haneda in clear weather conditions while on an evening approach. All 133 passengers and crew were killed. The accident held the death toll record for a single-plane accident until 1969. March 4, 1966: Canadian Pacific Air Lines Flight 402, a Douglas DC-8-43 registered CF-CPK, descended below the glide path and struck the approach lights and a seawall during a night landing attempt in poor visibility. The flight had departed Hong Kong Kai Tak Airport and had almost diverted to Taipei due to the poor weather at Haneda. Of the 62 passengers and 10 crew, only 8 passengers survived. On March 5, 1966, less than 24 hours after the Canadian Pacific crash, BOAC Flight 911, a Boeing 707–436 registered G-APFE, broke up in flight en route from Haneda Airport to Hong Kong Kai Tak Airport, on a segment of an around-the-world flight. The bad weather that had caused the Canadian Pacific crash the day before also caused exceptionally strong winds around Mt. Fuji, and the BOAC jet encountered severe turbulence that caused the aircraft to break up in mid-air at an altitude of 16,000 feet (4,900 m), killing all 113 passengers and 11 crew. The debris field was over 16 kilometres (10 mi) long. Although there was not a cockpit voice recorder on this aircraft or any distress calls made by the crew, the investigators did find an 8mm film shot by one of the passengers that, when developed, confirmed the accident was consistent with an in-flight breakup and loss of control due to severe turbulence. There is a famous photo of the BOAC plane taxiing past the still smouldering wreckage of the Canadian Pacific DC-8 as it taxied out to the runway for its last ever takeoff. February 9, 1982: Japan Airlines Flight 350, a McDonnell Douglas DC-8-61, crashed on approach in shallow water 300 meters short of the runway when the captain, experiencing some form of a mental aberration, deliberately engaged the thrust-reversers for two of the four engines. Twenty-four passengers were killed. July 23, 1999: All Nippon Airways Flight 61 was hijacked shortly after takeoff. The hijacker killed the captain before he was subdued; the aircraft landed safely. Haneda Airport has three terminals. The domestic terminals, 1 and 2, are connected by an underground walkway. A free shuttle bus runs between the domestic terminals and the smaller International Terminal every four minutes. Haneda Airport is open 24 hours, although two domestic passenger terminals are only open from 5 am to 12:00 am. Terminal hours may be extended to 24-hour operation due to StarFlyer's late-night and early-morning service between Haneda and Kitakyushu, which began in March 2006. International Terminal is open 24 hours. All three passenger terminals are managed and operated by private companies. Terminal 1 and 2 are managed by Japan Airport Terminal Co., Ltd. (日本空港ビルディング株式会社, Nippon Kūkō Birudingu Kabushikigaisha), while International Terminal is managed by Tokyo International Air Terminal Corporation (東京国際空港ターミナル株式会社, Tōkyō Kokusai Kūkō Tāminaru Kabushikigaisha). The critical facilities of the airport such as runways, taxiways and aprons are managed by Ministry of Land, Infrastructure, Transport and Tourism. As of March 2013, domestic terminals have 47 jetways altogether. A wide view of Haneda Airport's facilities and terminals. JAL and ANA cargo centers are on the far left. To the immediate right of the cargo centers is the Japan Meteorological Agency's Tokyo Airport Weather Observatory. To its right is the Tokyo International Airport Offices Building Two, and the tall white tower to its right is the airport's control tower. The Number Two Parking Area is to the right of the control tower, and Terminal 1 is to the right of the parking area. Terminal 2 is behind Terminal 1 and cannot be seen from this angle. To the right of Terminal 1 are JAL's maintenance centers, and on the far right of the photo are the international cargo facility and the international terminal. Terminal 1 called "Big Bird" opened in 1993. This is the largest terminal at Haneda Airport, replacing the smaller 1970 terminal complex. The linear building features a six-story restaurant, shopping area and conference rooms in its center section and a large rooftop observation deck with open-air rooftop café. Terminal 2 opened on December 1, 2004. It features an open-air rooftop restaurant, a six-story shopping area with restaurants and the 387-room Haneda Excel Hotel Tokyu. The construction of Terminal 2 was financed by levying a ¥170 (from 1 April 2011) passenger service facility charge on tickets, the first domestic Passenger Service Facilities Charge (PSFC) in Japan. The current international terminal opened on October 21, 2010. The first two long-haul flights from the new terminal departed before midnight on October 30, 2010. They were originally scheduled to depart after midnight on October 31, but both departed ahead of schedule. The international terminal has airline lounges operated by All Nippon Airways (Star Alliance), Japan Airlines (oneworld) and Cathay Pacific Airways (oneworld). The JAL lounge is also used by SkyTeam carriers at the airport. Haneda is the third-largest air cargo hub in Japan after Narita and Kansai. The airport property is adjacent to the Tokyo Freight Terminal, the main rail freight yard serving central Tokyo. In March 2012, Haneda completed a new "Premier Gate" facility for business jets, with parking available for up to 30 days. However, business jet operations are limited to eight slots per day, and these eights slots are shared with Japanese and foreign government aircraft, which receive priority in allocation over private operators. Haneda saw less than 2,400 business jet operations in 2013 and 2014; the operator of its sole business jet hangar, Wings of Life, became engulfed in scandal in 2015 after allegedly bribing a Japan Civil Aviation Bureau official to overlook its non-payment of rent. Japan Airlines operates training facilities and the Safety Promotion Center at the periphery of the airport. The ANA subsidiary ANA Wings has its corporate head office on the airport property. 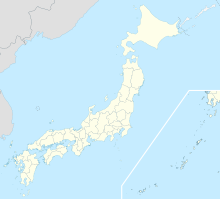 The Japan Coast Guard operates a Special Rescue Base (第三管区海上保安本部羽田特殊救難基地, Dai-san Kanku Kaijō Hoan Hombu Haneda Tokushu Kyūnan Kichi) at Haneda, which is used by the Special Rescue Team, an elite 36-member aerial and underwater rescue unit. Haneda Airport is approximately 1.5~2 hours from Narita Airport by rail or bus. Keisei runs direct suburban trains (called Access Express) between Haneda and Narita in 93 minutes for ¥1800 as of February 2019. There are also direct buses between the airports operated by Airport Limousine Bus. The journey takes 65–85 minutes or longer depending on traffic and cost ¥3000 as of May 2012. Haneda Airport is served by the Keikyu and Tokyo Monorail. The monorail has two dedicated stations (Haneda Airport Terminal 1 Station and Haneda Airport Terminal 2 Station), Keikyū operates a single station between the domestic terminals (Haneda Airport Domestic Terminal Station), and both lines stop at the International Terminal Station. Keikyū offers trains to Shinagawa Station and Yokohama Station and through service to the Toei Asakusa Line, which makes several stops in eastern Tokyo. Some Keikyū trains also run through to the Keisei Oshiage Line and Keisei Main Line, making it possible to reach Narita International Airport by train. Airport Limited Express trains make the nonstop run from Haneda Airport to Shinagawa in 11 minutes. Tokyo Monorail trains run between the airport and Hamamatsuchō Station, where passengers can connect to the Yamanote Line to reach other points in Tokyo, or Keihin Tohoku Line to Saitama, and have a second access option to Narita Airport via Narita Express, Airport Narita, or Sōbu Line (Rapid) Trains at Tokyo Station. Express trains make the nonstop run from Haneda Airport to Hamamatsuchō in 16 minutes. Hamamatsuchō Station is also located adjacent to the Toei Oedo Line Daimon station. The airport is bisected by the Bayshore Route of the Shuto Expressway and is also accessible from Route 1. Scheduled bus service to various points in the Kanto region is provided by Airport Transport Service (Airport Limousine) and Keihin Kyuko Bus. Tokyo City Air Terminal, Shinjuku Expressway Bus Terminal and Yokohama City Air Terminal are major limousine bus terminals. ^ a b "Tokyo Haneda airport – Economic and social impact". Ecquants. Retrieved September 7, 2013. ^ "Tokyo Haneda's new runway and terminal welcome more international services; almost 50 domestic routes served". anna.aero airline route news & analysis. 20 October 2010. ^ "羽田空港の国際線拡大、欧州・東南アジア便が就航". Nihon Keizai Shimbun. 30 March 2014. Retrieved 31 March 2014. ^ "Peach to offer Tokyo-Taipei service out of Haneda Airport". Nikkei. 16 January 2015. Retrieved 19 January 2015. The [transport] ministry's strategy has been to steer budget carriers, used mainly for leisure travel, toward Narita Airport. Major airlines, used chiefly for business trips, are encouraged to fly out of Haneda. ^ "ACI reveals the world's busiest passenger and cargo airports". Airports Council International. Retrieved 2 May 2018. ^ "大田区ホームページ：大田区のプロフィール". www.city.ota.tokyo.jp (in Japanese). Retrieved 2017-03-15. ^ a b c d e f g h i Imoto, Keisuke. "羽田空港の歴史". 地図. Retrieved 28 November 2013. ^ "東京・夢の島、名前の由来は海水浴場　空港計画も". 日本経済新聞. 15 November 2013. Retrieved 15 November 2013. ^ 喜多, 祐介 (13 August 2012). "羽田空港　米軍基地の記憶". NHK. Archived from the original on 3 December 2013. Retrieved 28 November 2013. ^ Susan H. Godson, Serving Proudly (Naval Institute Press). 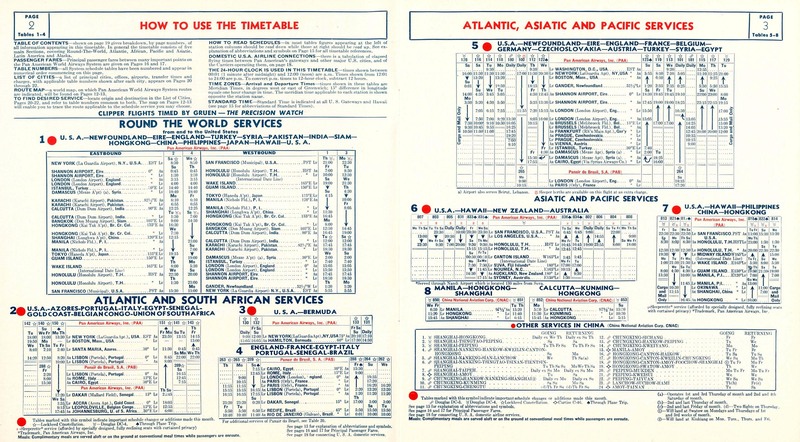 ^ "1947 – July 3 – Northwest Airlines Timetables, Route Maps and History". Airways News. Archived from the original on 4 March 2016. Retrieved 11 August 2015. ^ "Pan Am timetable, 1947". timetableimages.com. Retrieved 11 August 2015. ^ "エールフランス、日本就航60周年で飛行機予想図コンテスト 大賞はビジネス航空券". Retrieved 4 June 2015. ^ "All sizes – Narita 1966_0005 – Flickr – Photo Sharing!". Retrieved 4 June 2015. ^ Japan, China to consider Tokyo-Shanghai shuttle flights Archived 2007-03-11 at the Wayback Machine, Kyodo, October 10, 2006. ^ Shuttle flights to connect Tokyo, Shanghai in October, Channel NewsAsia, 25 June 2007. ^ 国交省：羽田－北京間にチャーター便　北京五輪の８月に[permanent dead link], Mainichi Shimbun, June 11, 2008. ^ Japan Airport Rises on Plan to Buy Macquarie Shares, Bloomberg News, May 20, 2009. ^ Nagata, Kazuaki, "Haneda new old kid on the block", Japan Times, 20 October 2010, p. 3. ^ HANEDA D-Runway Report (No.5) TO THE NEXT STAGE Archived 2011-10-08 at the Wayback Machine, HANEDA Airport Construction Office, MLIT, Japan, September 2009. ^ International Haneda flights to double by '10, The Japan Times, May 21, 2008. ^ a b "CAPA Profiles Japan awards international Tokyo Haneda Airport slots, but Narita Airport remains the main hub". CAPA. 9 October 2013. Retrieved 21 October 2013. ^ Mutzabaugh, Ben (18 October 2013). "AA to drop JFK-Haneda route, juggle Heathrow flights". USA Today. Retrieved 21 October 2013. ^ Fukada, Takahiro (7 January 2011). "Haneda's nighttime services falling short with travelers". The Japan Times. Retrieved 7 January 2011. ^ "Gov't to give slots to int'l charter flights at Haneda airport". Kyodo News. 7 January 2014. Retrieved 15 January 2014. ^ "Tokyo Haneda slot allocations fail to generate new flights as Europeans replace Narita operations". CAPA. Retrieved 29 December 2014. ^ Watanabe, Jun (3 October 2014). "Expanded Haneda slots creates problem for Narita, airlines". Nikkei Asian Review. Retrieved 29 December 2014. ^ "報道発表資料：東京国際空港国際線旅客ターミナル拡張について – 国土交通省". Retrieved 4 June 2015. ^ "スカイマークに羽田36枠、国交省が発表". 日本経済新聞. 26 December 2014. Retrieved 29 December 2014. ^ "羽田・成田発着を拡大、五輪へインフラ整備急ぐ". 日本経済新聞. 10 September 2013. Retrieved 10 September 2013. ^ "羽田―都心の新路線、ＪＲ東日本検討　五輪で利用増予想". 朝日新聞デジタル. 9 November 2013. Retrieved 11 November 2013. ^ "ＪＲ東、羽田新路線を北関東と直結　東北縦貫線との接続検討". SankeiBiz. 10 January 2014. Retrieved 17 January 2014. ^ "東京五輪、羽田への鉄道新線はなし　国交省 既存路線で対応". Nihon Keizai Shimbun. 1 July 2015. Retrieved 2 July 2015. ^ "羽田、国内・国際線をトンネル接続　乗り継ぎ改善". 日本経済新聞. 22 September 2013. Retrieved 24 September 2013. ^ Otake, Tomoko (10 April 2015). "Sandwiched between Yokota, Narita airspace, ever-busy Haneda looks to route some flights over metropolis". The Japan Times. Retrieved 7 May 2015. ^ "羽田発着枠拡大へ調査費計上　国交省、都心上空ルート設定で". Nihon Keizai Shimbun. 24 August 2015. Retrieved 25 August 2015. ^ Case Study on Commercialization, Privatization and Economic Oversight of Airports and Air Navigation Services Providers – Air Transport Bureau, Economic Analysis and Policy (EAP) Section, ICAO. 31 January 2012. ^ "Haneda Airport History | Enjoy Haneda Airport | Haneda Airport Domestic Terminal". www.tokyo-airport-bldg.co.jp. Retrieved 2018-04-22. ^ "Tokyo International ["Haneda"] Airport terminal 2: Interactive Google Street View photo and map". Geographic.org/streetview. Retrieved 2016-05-02. ^ Reed Business Information Limited. "Blogs". Retrieved 4 June 2015. ^ "Free Lounges, Pay Lounges and Conference Rooms". Tokyo International Air Terminal Corporation. Retrieved 30 November 2015. ^ "SkyTeam lounges in Tokyo, Haneda Airport". SkyTeam. Archived from the original on 8 December 2015. Retrieved 30 November 2015. ^ Yoshikawa, Tadayuki (29 January 2014). "「もう贅沢批判は止めた方がいい」ビジネスジェットは贅沢品か　堀江貴文氏に聞く". Aviation Wire. Retrieved 30 January 2014. ^ "ビジネスジェット、伸び悩み滞納か　羽田空港巡る贈収賄". The Nikkei. 24 September 2015. Retrieved 25 September 2015. ^ "JALグループ 安全啓発センター 見学予約サイト". Japan Airlines. Retrieved 25 September 2015. ^ "会社概要." ANA Wings. Retrieved on March 27, 2015. "本社所在地 〒144–8515 東京都大田区羽田空港3-3-2"
^ "特殊救難隊". Japan Coast Guard. Retrieved 25 September 2015. ^ "Air New Zealand Tokyo service changes in NW18". Retrieved 28 September 2018. ^ "ANA Announces New Service to Vienna". ANA Group. 15 October 2018. ^ "Cathay Dragon ends Tokyo Haneda service in Oct 2017". routesonline. Retrieved 15 April 2017. ^ "Cathay Dragon resumes Tokyo Haneda service in March 2018". routesonline. Retrieved 8 September 2017. ^ EastarJet adds Seoul Incheon – Tokyo Haneda in Sep/Oct 2018 Routesonline. 20 August 2018. ^ "Hawaiian Airlines Begins Ticket Sales for New Kona-Haneda Route" (Press release). Honolulu: Hawaiian Airlines. PR Newswire. 6 July 2016. Retrieved 6 July 2016. ^ "Jeju Air adds Seoul Incheon – Tokyo Haneda service from August 2018". routesonline. Retrieved 20 August 2018. ^ For 2006 to 2015: "暦年・年度別空港管理状況調書" [Yearly airport management statistics report] (PDF) (in Japanese). Ministry of Land, Infrastructure, Transport and Tourism. 17 August 2016. p. 6. Archived from the original (PDF) on 21 October 2016. Retrieved 13 October 2016. ^ For 2003 to 2012: "暦年・年度別空港管理状況調書" (PDF). Ministry of Land, Infrastructure and Transport. Archived from the original (PDF) on 1 November 2013. Retrieved 1 April 2014. ^ "航空輸送統計調査 速報（暦年）平成28年分" (PDF). Ministry of Land, Infrastructure, Transport and Tourism. ^ "How do I get to...? Haneda Airport". Keisei Electric Railway. Retrieved 28 May 2012. ^ "Haneda-Narita timetable". Airport Limousine Bus. Retrieved 28 May 2012. Wikimedia Commons has media related to Tokyo International Airport. Wikivoyage has a travel guide for Tokyo Haneda Airport.